(Newser) – When Matt Furie started drawing Pepe in the early 2000s, the Los Angeles artist conceived the character as an "everyman frog" living an "early 20-something hedonistic lifestyle," he tells the Atlantic. 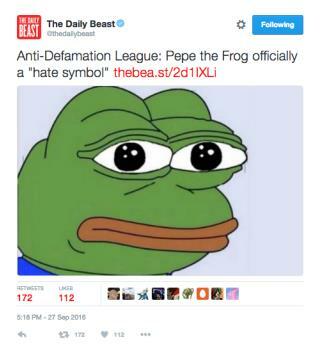 But the cartoon frog soon morphed into an Internet meme, and was then adopted by the "alt-right" white supremacist movement and Donald Trump supporters—and now the Anti-Defamation League has entered the once-innocuous amphibian, aka "Sad Frog," into its database of hate symbols, Time reports. "Once again, racists and haters have taken a popular Internet meme and twisted it for their own purposes of spreading bigotry and harassing users," ADL CEO Jonathan Greenblatt says in a statement. Sadly, I would say that Mr. Greenblatt hits the nail on the head and Mr. Furie is unrealistic about human nature. We kill them and eat their legs. Now we accuse them of being hate symbols? what isn't racist hate speech anymore?